Do It Yourself Special: FREE plans to add MIDI capability to the Roland SH-1000 with the Synhouse Original MIDIJACK The following plans describe a method of adding MIDI capability to the Roland SH-1000 analog synthesizer with the Synhouse Original MIDIJACK. 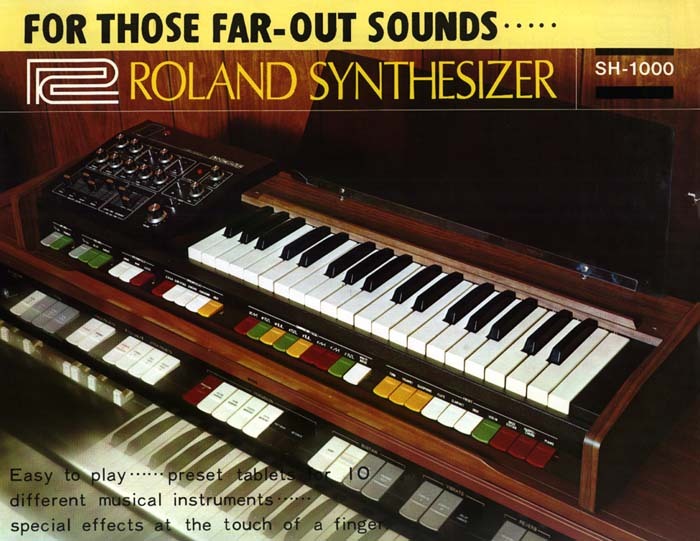 The SH-1000 was the very first synthesizer from Roland, and just like the first instruments from Korg, Linn Electronics, Moog, Oberheim, Sequential Circuits, the SH-1000 and the SH-2000 sounded better than what came later. Some drilling is required. There is plenty of space on the SH-1000 to mount the MIDIJACK with the provided hardware. You may be able to do this yourself if you have experience with electronic repair and the soldering of wires and circuit boards. If not, it is recommended that you send the instrument to Synhouse L.A. for a quick, low-cost Factory Installation. The particular installation on which this document is based was not done by Synhouse, but rather a very courteous Analog User, so neither Synhouse nor the Analog User who provided this is responsible for the accuracy of this infomation, nor any damage to your instrument or Original MIDIJACK resulting from the use of it, misuse of it, or inability to use it. Those who choose to read it and use it do so at their own risk. Synhouse does not have any direct knowledge about this particular installation, but the author may be willing to answer questions if they are asked nicely, and Original MIDIJACK customers doing an SH-1000 installation may ask to be privately referred to the author by e-mail. It is best to download these notes and photos and print them out on paper to look at while working on the instrument and make notes and check off the steps as you go. As with any project, you should completely read and understand each step of the instructions before starting. All repairs and modifications made to your instruments will be done at your own risk and Synhouse Multimedia Corporation assumes no liability for personal injury caused or damage to equipment or loss of use caused directly or indirectly by the use of these plans. If in doubt, don't do it! After installation MIDIJACK best is tuned down 3 octaves, using the -36 setting of the MIDI Transpose Select Mode, because the SH1000 CV is only linear adjustable between 0.2 and 5.6 V (1.8V/Oct). I didn't reach to adjust the SH1000 for more as those three octaves. Although MIDIJACK went higher SH1000 went completely out of pitch. When adjusted, the bypassed keyboard is bad tuned, because of the 0.2V offset, but for internal keyboard use this can be tuned with the tunepot. Power for the MIDIJACK very easy to find. Several points can be found by using the Layout plan and the Schematic that I sent you. Gate can not directly be connected. An additional circuitboard has to be designed, but its ultra lowcost. To install gate, two tracks have to be cut. To bypass Gate a mechanical dual switch has to be used. Mounting the MIDIJACK PCB in the SH1000 back is a little bit tricky because there is 1cm wood everywhere. In the front is not enough space and in the back panel neither. Therefore some special holes have to be made to make the MIDIJACK switch come through the back of the SH1000. Additional costs: Not to be mentioned. Additional challenge: Exactly as much for having as much fun as possible. Additional fun: It was good fun, Synhouse support is great.